In the wake of DC’s recent god-based shenanigans as part of the Justice League comic’s Darkseid War event, we’ve been getting one-off issues exploring how each League member has been dealing with their newfound godhood. In Green Lantern’s case though, his issue ended up showing how much better Hal is without it. This is how Justice League #45, out today, begins. It’s a bit of an understatement. Spoilers for Justice League Darkseid War: Green Lantern #1, by Tom King, Doc Shaner, and Chris Sotomayor. The story, wonderfully written by Tom King (who also wrote one of the other best comics in recent memory, last week’s incredible The Vision #1), sees Hal placed in a nightmare scenario: with Darkseid dead, his legions of Parademons aimlessly descend on Oa in an attempt to find someone powerful enough to be their new ruler. Only instead, when the Lanterns refuse to bend their knees, the planet is slaughtered—and Hal is left standing alone against millions of demons and the resurrected, corrupted corpses of his allies. It leaves Hal with a petrifying choice: die as a Lantern, or become a God to save his people. Throughout the dilemma, as Hal fights and never gives up, the story flashes back to a nightmare scenario from Hal’s past: the death of his father in a plane crash. The young Hal goes to a church to light a candle in his Dad’s memory, but he’s too upset and angry to see the point. If Gods were real, why didn’t they save his father from death? What good is a God if they can’t stop good people from dying, and instead watch them fall? The young boy is comforted by a stranger at the church, who tells him that Gods might have power, but all they can do is observe, tied to a greater destiny that that robs them of any sort of free will. 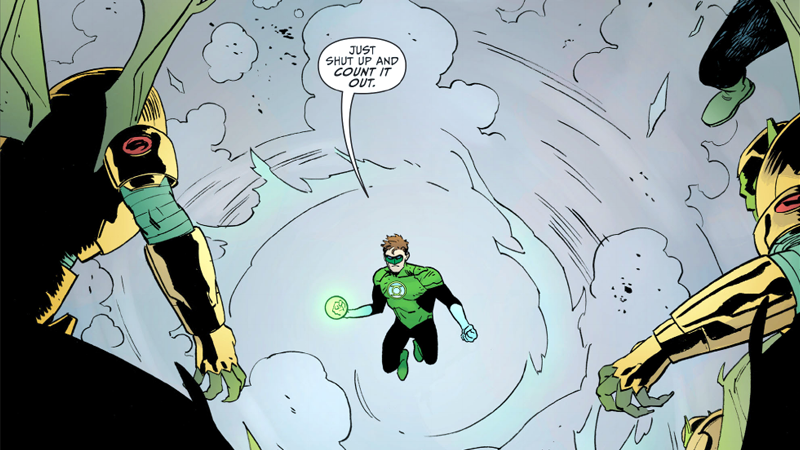 The story inspires Hal in the present to choose godhood: merging his Lantern Ring with the control box that grants power over the Parademon hordes to become the God of Light (and get a snazzy costume in the process that’s way better than his cosmic hobo look in the ongoing Green Lantern comic). But despite the fact that he has the power to restore Oa and the Lanterns to the way they were before the Parademon attack—and Hal does so—he quickly realizes what the stranger said to him all those years ago was right. A god can only really watch, not act: they trust in the will of mortals to actually enact change. And in a bit of wibbly-wobbly, timey-wimey shenanigans that wouldn’t look out of place in an episode of Doctor Who, Hal realizes that the stranger that told him that was his future, god-like self, projecting himself back in time. And it’s what makes Hal Jordan who he is—a man with the power of will itself, and a man who’s always wanted to use that power to change things. To save people’s lives, to be a hero. In a single issue, King nails everything about what makes Hal Jordon a great superhero. In the end, Hal discards his new power and races back to Earth to try and convince Batman (who already ascended to Godhood) of the terrible mistake he’s making by trying to use his god-powers to free Gotham of crime. Because Hal understands something that Bruce hasn’t quite gotten to yet: it wasn’t absolute power that made them heroes. It was their choice to stand up and be heroes of their own volition that turned them into the upstanding members of the Justice League they are today. A will to fight—something neither of them can do in the position of Gods. If we could get a Green Lantern half as wonderfully realized as this in DC’s other series, that would be great.